USA TODAY sings that “Fans of Louisa May Alcott can rejoice” thanks to this charming and uplifting story of the imagined lives of three of Jo March’s passionate, spirited descendants—that’s Jo March from Little Women! With her older sister, Emma, planning a wedding and her younger sister, Sophie, preparing to launch a career on the London stage, Lulu can’t help but feel like the failure of the Atwater family. Lulu loves her sisters dearly and wants nothing but the best for them, but she finds herself stuck in a rut, working dead-end jobs with no romantic prospects in sight. Then Lulu stumbles across a collection of letters written by her great-great-grandmother Josephine March. As she delves deeper into the lives and secrets of the March sisters, she finds solace and guidance, but can the words of her great-great-grandmother help Lulu find a place for herself in a world so different from the one Jo knew? As uplifting and essential as Louisa May Alcott’s Little Women, Gabrielle Donnelly’s novel will speak to anyone who’s ever fought with a sister, fallen in love with a fabulous pair of shoes, or wondered what on earth life had in store for her. This reading group guide for The Little Women Letters includes an introduction, discussion questions, ideas for enhancing your book club, and a Q&A with author Gabrielle Donnelly. The suggested questions are intended to help your reading group find new and interesting angles and topics for your discussion. We hope that these ideas will enrich your conversation and increase your enjoyment of the book. Emma, Lulu, and Sophie Atwater are sisters who couldn’t be more different. They adore one another and drive each other crazy in equal measure. Middle sister Lulu feels like the black sheep of the family—at twenty-four, she still doesn’t know what she wants out of life. One day in her parent’s attic, she finds a collection of letters from her great-great-grandmother Jo March. Finally someone seems to understand Lulu. Jo didn’t always get along with her sisters Meg, Beth, and Amy, and she, like Lulu, assumed that she was too quirky and opinionated ever to find love. As the family gets ready for Emma’s wedding, Lulu realizes that she can’t keep the letters to herself—Grandma Jo belongs to all the Atwater women. 1. Jo March writes in a letter from 1888, “times are changing for girls, blessedly” (page 2). What new liberties does Jo enjoy during her lifetime, according to her letters? How does Fee Atwater continue her great-grandmother’s passion for women’s rights? 2. Emma, Lulu, and Sophie have different reputations in the Atwater family: Emma is responsible, Lulu is challenging, and Sophie is dramatic. When does each sister act out of character and defy her family’s expectations? What are the results? 3. When Lulu begins reading Grandma Jo’s letters, she decides, “at the moment she felt she rather needed something that was only hers” (page 126). Why does Lulu choose to keep Jo’s letters to herself? How does Lulu decide when it’s time to share Jo’s legacy? 4. Lulu struggles to find direction in her career and romance. What wrong turns does she take along the way? How does she know when she has found a career and a boyfriend? Were you surprised that Lulu’s future doesn’t involve Tom or working with animals? Why or why not? 5. As Lulu traces the March family history to the present, she picks up on some hereditary traits: “They had shared long faces—which Fee and Sophie had inherited, but not Emma or Lulu—political awareness, and an interest in the arts” (page 127). What else has the Atwater family inherited from the March family? Which of the March sisters—Meg, Jo, Beth, or Amy—does each Atwater sister resemble most? Which sister are you most like? 6 When Lulu begins reading Jo’s letters written in New York, she believes, “The past was safe and held no surprises; the past, she knew, had a happy ending” (page 189). What surprises does Jo’s past hold after all? How does Lulu react when Jo’s New York adventures end unexpectedly? What does Lulu learn about relationships and love from Jo’s letters? 7. Both Emma and Lulu try on new looks: Emma buys an expensive pair of shoes that make her feel like a “Josephine,” and Lulu cuts her hair into “a close-cut curly crop” during Emma’s spa weekend (page 308). What inspires each sister to change her look, and what are the results? 8. What is Charlie’s role in the Atwater family? Why is she so generous to Lulu and her sisters? How does Liam, Charlie’s brother, bring out a new side to her character? 9. Discuss how Jo mourns Beth in her letters. Why does Jo write to her sister after her death? After Fritz’s proposal, Jo writes, “I think I shan’t write to you again, Bethie” (page 326). Why is it time for Jo to stop writing to Beth? 10. While Lulu learns lessons from Grandma Jo’s letters, Sophie meets two older women who influence her life: her downstairs neighbor Mrs. Scott-Ramsay and Aunt Amy. What does each of these women teach Sophie? 11. Consider the novel’s London setting. How does London look, sound, and feel in the novel? What do the sisters love about living in London? How does Emma feel about moving away from the city? 12. Discuss the ending of The Little Women Letters. What advice does Jo March give her future great-great-granddaughter in her final letter? What is the effect of having Jo conclude the novel? 1. Get inspired by Grandma Jo’s correspondence and draft a letter to your own great-great-granddaughter. What would you want to tell her? What advice would you give her? 2. Whether or not you have read Louisa May Alcott’s Little Women, select this classic for your next book club discussion. How does the Jo March in The Little Women Letters compare to the Jo March in Little Women? What are the similarities and differences between the March and the Atwater families? To finish off your discussion, watch Little Women with your book group—pick from the 1994, 1949, or 1933 versions. 3. In the novel, Emma wonders what her life would be like if she called herself “Josephine.” What does your name mean? Look up the origin and popularity of your name and the names of other characters in The Little Women Letters: http://www.thinkbabynames.com/. Tell us about the first time you read Little Women. How has Louisa May Alcott’s novel changed for you as you’ve reread it over the years? I can’t even remember the first time I read it, because when I was a child it was not so much a book for me as an integral, and most precious, part of my life. I had a quite lonely childhood in many ways. I was the only girl among four brothers and fate had played something of a sadistic trick in that I was the second eldest, so that I spent the first four years of my life as part of a normally gender-balanced household and over the course of the next five, I watched myself being slowly overtaken by a sea of testosterone until by the time I was ten I was living in a not-so-very-glorified male locker room. I was probably about nine when I discovered the March sisters—I know that twelve-year-old Amy seemed quite grown-up to me, while Meg was unthinkably sophisticated—and the idea of a world where siblings sat by the fire and had conversations instead of throwing footballs at each other was pure paradise. The Marches immediately became the family I didn’t have and remained so throughout my teens. I still turn to Little Women for comfort reading, and one of the many wonderful things about it is that it doesn’t change. I don’t agree with all of its messages—I wish, for instance, that Meg were allowed to admire pretty things a little less guiltily, and I think that Jo had every justification for being furious when Amy burned her book—but I’ve always thought that. The Marches aren’t perfect and Louisa May Alcott isn’t one size fits all. That’s why I love them. What were your other favorite books when you were growing up? I was a very dreamy child and do seem to have had an attraction to the past. There was another series of books set in nineteenth-century America called What Katy Did by Susan Coolidge about a girl called Katy Carr and her siblings—for some reason they seem to have been more popular in Britain than in America, and I loved them. There was also an Edwardian English author called E. Nesbit who wrote books about nice middle-class children who would go off on amazing magical adventures during the day and then come home in the evening to boiled mutton and treacle pudding and Father reading the paper in his study. When I was in my teens I discovered historical fiction—an author called D. K. Broster wrote mostly about the eighteenth century and created the most gloriously romantic young heroes who quipped and swashbuckled their way through various adventures and I fell in love with every single one of them. My favorite D. K. Broster book was The Flight of the Heron, about a young Scottish chieftain called Ewen Cameron of Ardroy (oh, be still my heart) who went to fight for Bonnie Prince Charlie in 1745. I fell head over heels in love, not only with him but with Bonnie Prince Charlie too, and remained so for an embarrassing number of years. You won the book contract for a Little Women sequel. How did you land this dream job? Yes, it was a pretty nice gig, wasn’t it? An extraordinarily imaginative and talented editor called Lydia Newhouse, who at the time was working for Michael Joseph in London, had the original idea of interweaving the lives of Jo March’s great-great granddaughters with some lost letters of Jo’s—she asked a few writers to come up with a sample first chapter and was kind enough to choose mine. I decided to set the story in London because I grew up there, so I know the city very well, and it seemed a more appropriate setting for this sort of tale than sunny, modern Los Angeles where I live now. Three of the March sisters adapted themselves very nicely, I think, to modern living—shy little Beth didn’t want to leave the nineteenth century so I left her in peace there! A bridge between the past and the present is the underlying theme of women’s rights. Jo March has been a role model for more or less every feminist who has come after her, and I wanted that independent spirit to be carried down through her line of female descendants, ending with the modern girls’ mother, Fee, whom I send up slightly as one of the placard-wielding seventies feminists. But that generation—of which I am most proud to be a member—did finish the job at hand, because the modern Atwater sisters are the first young women in the family to have the luxury of not needing to think about feminism. They can simply assume that they are equal to men—which is as it should be, of course, but nevertheless is a very new state of affairs. I think Jo would be delighted with them. Tell us about the research you did while writing this novel. Did your background as a journalist come in handy? There were two very different sorts of research involved. One was finding out how people lived in nineteenth-century Massachusetts; the other was finding out how people live today, which for this troglodyte author was every bit as much of a challenge as the first. The historical research was relatively simple. I just read and re-re-reread all of Louisa May Alcott’s works, not especially following the stories but looking for clues to how people lived then, what they wore, what they ate, how they furnished their houses. If you read a book with that particular focus, it’s surprising how much you can pick up, and with that as a background—augmented by the occasional Internet check for more specific details—I was able to let my imagination run free. For the lives of the modern characters I was required to be more of a journalist and interview other people about their daily lives—I spend most of my own working life sitting beside a word processor and really don’t know how other people go about their days! But I do know people who are actors or doctors or family therapists, and they were all extremely generous with their time in giving me the background for those characters. I never started writing a character or an incident until the background was fully in place, because if you’re creating a character, you really do have to know much more about them than you tell the reader. For instance, for Fee’s therapy practice I was going to have her patients walk up and down the family staircase to their appointments until the real-life therapist I spoke to told me that that wouldn’t happen, the family would have had to build on a separate staircase for patient privacy. Which I have never once referred to in the book, but I know it’s there. As a Londoner currently based in California, what do you miss most about London? What details of contemporary London life did you try to capture in this novel? I’m lucky enough to be able to visit London at least once a year and to have very good friends I stay with in a warm and welcoming house in Islington which might just seem a little oddly familiar if any readers of the book were to visit it! I like to visit but I find I’m happier living in Los Angeles. My family is Irish, not English, and I never really fit into mild-mannered Anglo-Saxon society; I also suffer quite badly from seasonal affective disorder and get horribly depressed during the dark English winters. But it was very nice indeed to spend a virtual year there while I was writing the book—I enjoyed all the best bits and was able to come back to the real world of California when the cold started to get to me. For the details of London life, I put my journalist’s hat back on again and mercilessly grilled a group of Londoners I know about every hour of their every day, about which they were all most patient and informative and which I, if not they, found most interesting. As in Little Women, I tried to give a sense of the passing of the seasons. I’ve mentioned the clothes people would be wearing through the year, and most chapters contain at least one reference to a food or flower that would be in season then—I hope they’re accurate, although I did slip up on at least one occasion and very nearly had jasmine blooming in the spring, as it does in LA, instead of in the summer. I caught it at proof stage and changed it to freesia, which has the same number of letters! The sisters in this novel have such rich, complex relationships. Did you draw upon your own family to inspire the bonds among Emma, Lulu, and Sophie? I can’t think my brothers would be pleased to be compared to a bunch of sissy girls! But in a way I did draw on them. I didn’t have sisters but I did have siblings, so am very familiar with that environment—the casual closeness, the bickering, the in-jokes. Particularly important is the pecking order, which is something I’ve always been interested in and which I’ve been able to experience from both sides lately, as I am most firmly one of the eldest in my own family, and had always bemoaned that my younger brothers seemed to have had life easier; however, my husband is the youngest of four and—much as his siblings love him—I am sometimes shocked at the lack of family clout he wields! Emma has a line at one point where she says to Sophie, “Do you really think I’d make something up just to impress you?” Which came from seeing family life through my husband’s perspective. It’s taken for granted that the younger siblings want to impress the older, but nobody bothers to want to impress the poor youngest. The Little Women Letters balances voices from two time periods: the nineteenth century of Jo’s letters and the present day of twentysomething Londoners. How did you get these voices just right? Well, I hope I got Jo’s voice right, but I’m sure that a few modernisms will have slipped in along the way! The voice of the modern Londoners was an interesting challenge. I left London thirty years ago and language has changed considerably since then. When I left, “brilliant” still meant “very clever!” I wanted at all costs to avoid the trap that some authors fall into as they get older, which is to have their younger characters speak as the author would have when she was that age. “I say, Sophie, old thing, that’s perfectly spiffing of you,” was not what we wanted! So I flung myself on the mercy of my young Londoner friend Harriet Barber and sent her the book chapter by chapter to approve the dialogue—which she very kindly and meticulously did. It was a fascinating process for me. I learned, for instance, that the word “rather,” as in “rather good,” was of my generation, not Harriet’s, which hadn’t occurred to me. I also learned that a modern young woman wouldn’t describe two similar people as “birds of a feather,” but would describe them as “like as two peas in a pod,” which surprised me because I would have thought that was a somewhat old-fashioned image, but it is a very pretty one, and I was pleased to know that it is still in use. Towards the end of the book, Harriet surprised and amused both of us by following Lulu’s footsteps and moving into a flat in Belsize Park with a former college roommate. In view of which, I was tempted to write an extra chapter in which Lulu’s older friend, a writer living in Los Angeles, won the lottery and became exceedingly rich. . . .
How did you choose cooking as the profession that Lulu has been searching for? Are you the chef of your own family? This was inspired by a young American friend of my husband’s and mine called Elizabeth Montez, a most bright and capable young woman, who graduated college with an excellent degree but who couldn’t decide for many years afterwards what she wanted to do until she suddenly decided to go to chef school and it all fell into place. I’ve always enjoyed cooking, so I felt very comfortable about describing someone who was a foodie. And I’ve known a few chefs, so I know how forensic they can get about their food. Last summer, to celebrate finishing the book, we went to visit Elizabeth, who was interning at a resort on completely magical Orcas Island just off the coast of Washington. The food there is delicious—everything is local, organic, and exquisitely prepared—and I was amused to notice that, while my husband and I were just vacuuming it up and enjoying, Elizabeth was saying things like, “Well, I like the back taste of marjoram, but I’m disappointed they used honey from acacia instead of orange blossom. . . .” She didn’t even know who Lulu was, but she’d turned into her! The Atwater sisters have several brushes with fame in the novel: Emma befriends a shoe designer and a famous actress, and Sophie works with a TV star and a renowned theater director. Who inspired these fabulous characters? Did you have particular celebrities in mind? It’s hard to live in Los Angeles and not know at least a few actors! It hadn’t occurred to me that so many of these minor characters seem to be larger than life. I do know a lot of fairly noisy people—I’m noisy myself, so is my husband, and so are both our families, so I’m quite comfortable creating people who are strong tastes. I can’t say that any of the famous characters in the book are meant to be anyone you’d recognize—they are just very much types whom you will meet if you hang around in theatrical circles in London, Los Angeles, or anywhere else in the world. The only one who was suggested by anyone in particular is, oddly enough, the quiet one, Colin Hobbes. He was very—very—loosely inspired by a Greek-American actor friend who is very dark and dramatic looking and always plays fiercely intense roles on the screen, but off it is the sweetest, most low-key person you could hope to meet. And I suppose there’s just the mildest hint of George Clooney too. Colin is a big-shot actor playing a doctor on TV who is very kind to the less powerful actors on his show. I’ve known various people who worked with George when he was on ER, and they’ve all said the same about him. 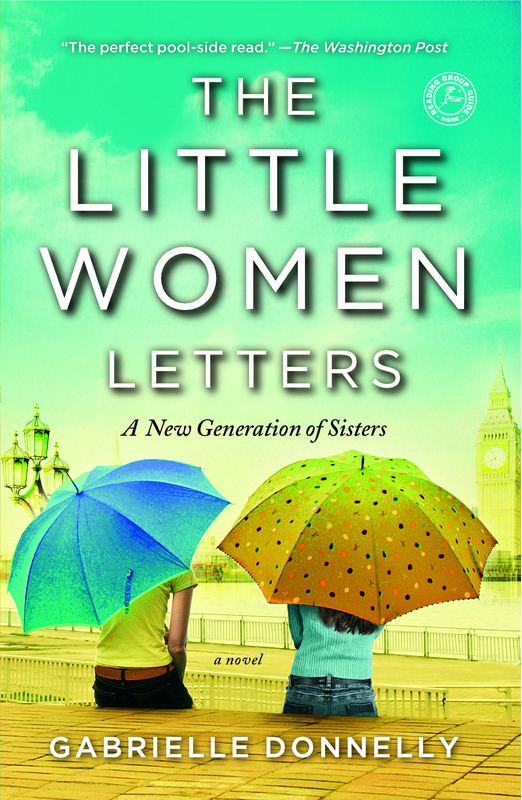 Besides the three sisters, The Little Women Letters sparkles with lively secondary characters. Who is your personal favorite among the sisters’ relatives, friends, and love interests? I have a huge soft spot for Nigel-Manolete, who was one of those characters who strolled onto the stage from nowhere and somewhat took it over. Originally I just wanted someone to draw Emma’s attention to the shoes in the shop window, but Nigel-Manolete made it plain from the beginning that he had bigger plans! I like Nigel because he knows who he is and can’t be bothered with pretense or affectation—and that includes not toning down his eccentricities in order to comply with conventional expectations. He also sees a side of Emma her family doesn’t see and that allows her to be a little younger and more frivolous with him than there is room for in the family structure. He gives her some playtime and high time too! I’m also particularly fond of Liam, whom I see as a sort of alternate ending for those many of us who were so disappointed that Jo chose to marry a middle-aged professor instead of handsome, romantic Laurie. I started to think about Liam a long time before he actually arrived on the scene. I quite quickly realized that he wouldn’t call his sister Charlie because, obviously, Fitzcharles would be his surname too. And immediately his voice was in my head saying to Lulu, “Well, ‘Charlie’ wouldn’t narrow the field much where I come from . . .” and from then on I felt I knew him very well. I was very much indeed looking forward to his arrival because poor old Lulu had such a miserable year—at the time when I was writing the parts about her working in the pub and being so unhappy, I actually gave myself permission to skip forward to write the scene where they meet, just to cheer myself up! Louisa May Alcott wrote two sequels to Little Women. Can you imagine sequels to The Little Women Letters? What adventures might the sisters face next? I’d love to write a sequel because I think all three sisters are heading in very different directions and I want to see how they get on with them. Emma is going to have to do some major readjustment of her life in North Dakota—she’s going to have to throw her city girl assumptions out of the window and learn to live in a small town. She’s also going to have to start asking people for help, which is difficult for her right now but might well be a useful lesson. Lulu’s adventure will be very different. She’s found her soul mate, and she’s found her vocation in life, and now she has to learn to live with them both and to get used to being happy and fulfilled. She’s also going to get to know Liam more fully—they both know they belong together but they hardly know each other yet, and that’s always a journey. Sophie still has some growing up to do. She’s on the verge of a theatrical career, but she’s still an innocent in many ways and is going to have to learn how to negotiate some backstage politics. And we don’t quite know yet where she is with Jamie. They’ll always be in each other’s lives, but they’re both a little young for happily ever after—and I’d like to see her have a romance that didn’t come quite so easily. . . . Meanwhile, there are some other women we could be looking at—the women who came between Jo March and the Atwater sisters. Who was Grandma Cissie? Who was Grandma Jojo? And what was Fee like when she was young . . . ? Gabrielle Donnelly was born and raised in London where she worked as a journalist on women’s magazines before moving to Los Angeles to specialize in show business journalism. She lives in Mar Vista, California, with her husband, Owen Bjornstad. Visit GabrielleDonnellyAuthor.com.